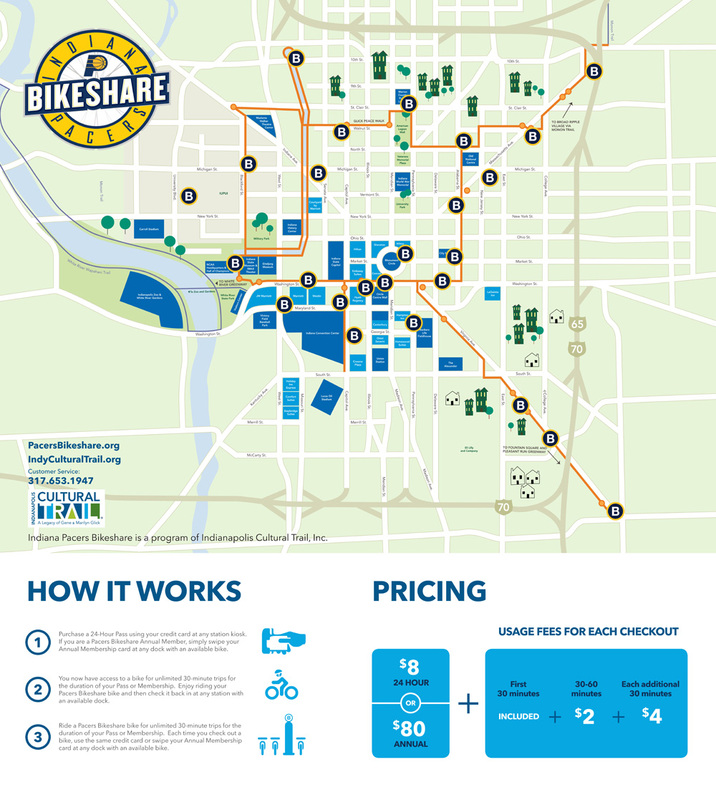 The non-for-profit group that maintains the Indianapolis Cultural Trail plans to launch a bike-sharing program on April 22, with 250 bicycles available to rent across 25 different stations along the downtown path. The program has been dubbed Indiana Pacers Bikeshare, as per the wishes of The Herbert Simon Family Foundation, which made a significant donation toward startup and operating expenses. Herbert Simon owns the NBA team. Indianapolis Cultural Trail Inc., which will operate the program, announced details on Friday. ICT is using a $1 million grant from the U.S. Department of Transportation to purchase 250 bikes and related equipment, said Executive Director Karen Haley. She declined to reveal the amount of the Simon donation. Users will be able to purchase annual memberships for $80, or 24-hour passes for $8. To encourage the “sharing” aspect of the program, users will be able to check out bicycles in 30-minute increments. If a ride extends past 30 minutes, the user will be charged another $2 for the next half hour and another $4 for each additional 30-minute period. Indianapolis Mayor Greg Ballard, a high-profile supporter of cycling, praised the program. The Cultural Trail opened in May, with its funding split between $35.5 million from the federal government and $27.5 million in private donations. It has been recognized nationally as a trailblazing amenity for urban dwellers.